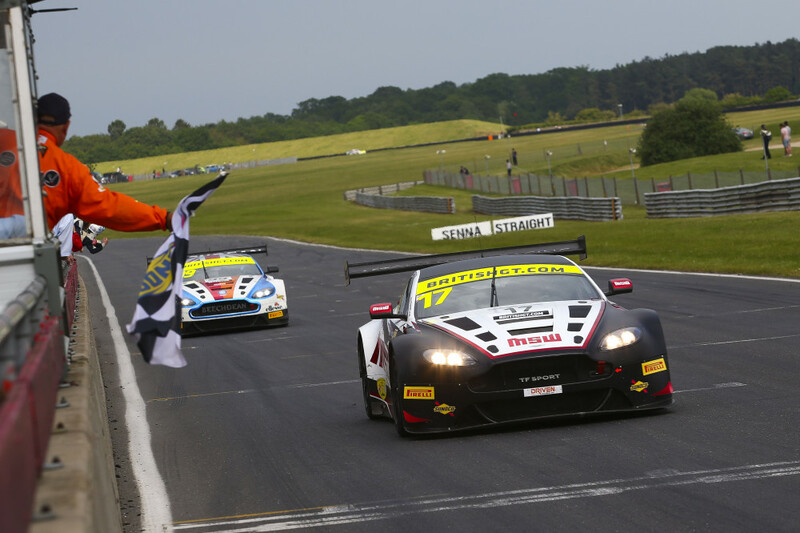 Derek Johnston and Marco Sorensen gave TF Sport and Aston Martin their second British GT victory of the day at Snetterton after fending off Beechdean AMR’s similar V12 Vantage over the closing stages of this afternoon’s 60-minute race. Meanwhile, a stunning comeback drive resulted in first GT4 wins for Century Motorsport’s Ben Tuck and Ben Green, as well as BMW’s maiden class victory in the series. Derek Johnston and Marco Sorensen rounded off a dominant weekend for TF Sport by adding to their team-mates’ two poles and Race 1 victory after prevailing in a close battle with Andrew Howard and Darren Turner. Mark Farmer and Nicki Thiim completed the podium after the full 10s pitstop success penalty dropped them behind the top-two at half-distance. A Safety Car period – required at the end of lap one to retrieve Ben Barnicoat’s damaged Track-Club McLaren – left Thiim with less time to convert his pole position into a meaningful lead over Sorensen, who jumped from third to second at the start. Indeed, the two Aston Martins circulated roughly two seconds apart before the pit window opened, ensuring that Johnston would re-join ahead after the mandatory driver change. Turner also remained close enough to the #17 Aston Martin and similarly handicapped #33 Barwell Lamborghini during the opening stint to vault Beechdean AMR from fourth to second after the stops. And from there co-driver Howard set about reducing the gap to race leader Johnston. The two Vantages were soon running together but, try as he might, Howard was unable to pressure Johnston into a mistake. They remained locked together until the chequered flag where just 0.5s separated the pair. Behind, slick work from TF Sport’s pit crew helped Farmer re-join marginally ahead of Jon Minshaw whose Barwell co-driver Phil Keen had pitted from third. While the #11 Aston Martin pulled clear to claim its second podium of the weekend, Minshaw slipped into the clutches of Optimum Motorsport’s Flick Haigh, who soon demoted the Huracan to fifth. That temporarily became sixth in the closing moments when Graham Davidson’s lunge at the Wilson hairpin resulted in contact and sent Minshaw spinning. The move earned Jetstream’s driver a 30s post-race penalty and saw Barwell’s #33 Huracan move back up to fifth in the final classification. 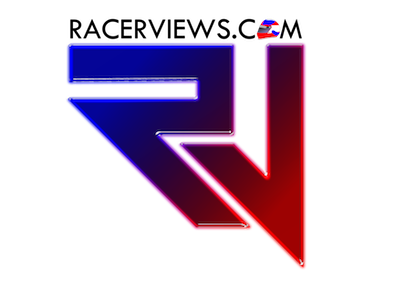 That also promoted Jordan Witt and Struan Moore’s RJN Motorsport Nissan to sixth aead of Lee Mowle and Yelmer Buurman (ERC Sport Mercedes-AMG), and Rick Parfitt Jnr and Ryan Ratcliffe (Team Parker Bentley). Davidson and co-driver Maxime Martin slotted into ninth ahead of Sam De Haan and Jonny Cocker (Barwell). Sorensen added the Sunoco Fastest Lap of the Weekend trophy to TF Sport’s haul, whileFarmer completed a perfect two days for the team when he was named Blancpain Driver of the Weekend for claiming Race 1 pole, a victory and third place. All of that sees Mowle and Buurman continuing to lead the GT3 Drivers’ standings by 4.5 points from Minshaw and Keen. Howard and Turner are 8.5 further back in third. Ben Green, Ben Tuck and BMW claimed their maiden British GT4 victories in Snetterton’s second race this afternoon’s despite spinning in the opening stint. Tolman Motorsport’s McLaren duo of Lewis Proctor and Jordan Albert scored their first podium together in second while Academy Motorsport’s Matt Nicoll-Jones and Will Moore completed theirs and Aston Martin’s excellent weekend with a second third place finish. Green was running amongst the lead battle when he and Dan Mckay’s Equipe Verschuur McLaren made contact, which sent the M4 spinning down to 12th. Green had recovered two of those places before the pit window opened, and Century’s decision to pit a lap earlier than their rivals – as well as Tuck’s pace thereafter – helped the BMW immediately jump up to fourth. That became second when both David Pattison and Will Moore were dispatched in quick succession, but it took until the penultimate lap for Tuck to reel in and pass long-time leader Proctor. The opening stint represented GT4 at its very best thanks to multiple manufacturers battling nose-to-tail at the front. Nicoll-Jones initially converted pole position into a slender lead but was soon overhauled by Century’s second BMW driven by Jack Mitchell, who also started on the front row. Joe Osborne, Mckay, Scott Malvern and Jesse Anttila completed an incredibly close top-six when the pitstop window opened after 25 minutes. The combination of Silver Cup minimum pitstop times and success penalties jumbled the order after the driver changes shook out, with Osborne’s co-driver Pattison now leading ahead of Tolman team-mate Proctor. The amateur driver was always likely to lose ground against his younger rivals, though, so it was no surprise when he dropped to fourth behind Proctor, Moore and Tuck. Thereafter it was all about the BMW driver whose charge up the order first saw him pass Moore’s Aston Martin and then Proctor’s McLaren, which had originally pitted from seventh in the hands of Albert. 2.5s covered the top-two at the finish. Balfe Motorsport’s Graham Johnson and Mike Robinson put the disappointment of Race 1 retirement behind them to claim fourth overall and Pro/Am victory ahead of HHC’s #55 Ginetta driven by Callum Pointon and Patrik Matthiesen, while Tolman’s second Silver Cup 570S of Charlie Fagg and Michael O’Brien completed the top-six. Pattison and Osborne’s McLaren finished seventh ahead of the BMW shared by Mitchell and Alexander Schjerpen, which had led early on. Two Mercedes-AMGs completed the points-paying positions with Fox Motorsport’s Mark Murfitt and Michael Broadhurst beating Team Parker’s Nick Jones and Malvern to ninth. Elsewhere, Equipe Verschuur’s Mckay claimed the Sunoco Fastest Lap of the Weekend prize while PMW Expo Team of the Weekend went to UltraTek Racing Team RJN who spent all of Saturday and then Sunday morning replacing their #53 Nissan’s engine and fixing the resulting issues. Just half-a-point now separates Pointon and Matthiesen from O’Brien and Fagg at the top of the GT4 drivers’ standings. Nicoll-Jones and Moore are third while today’s winners Tuck and Green, and Osborne and Pattison move up to fourth and fifth respectively.